I think that most of us see Kool Aid as something that you make a drink out of. This is true for the most part but there really is so much more to Kool Aid. With its strong flavors and bright colors there is so many things you can do or make with it. 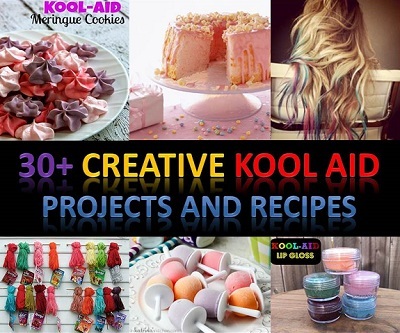 Here is a fantastic roundup on 30+ Creative Kool Aid Projects and Recipes. Have a look through these creative ideas as I am sure that you are going to love them. Empty the can of sweetened condensed milk into a microwave safe bowl. Microwave for 1 minute on high to heat the milk. Add the unflavoured gelatine (if you are not adding the unflavoured gelatine then you do not need to heat the milk in the microwave). If you do not think the milk is hot enough to dissolve the gelatine microwave for another 30 seconds. Add your Kool-Aid package to the milk and stir together until it starts to thicken. Fold in 2 large scoops of whip cream of whip cream. Pour this filling into a pie crust. Top with an additional layer of whip cream. Refrigerate for at least 4 hours and enjoy. ~If you are not using the gelatine the pie still works and tastes great. It will have more of a consistency of a soft cream pie but still very delicious. With the gelatine the pie has the same flavour but holds its shape together. Copyright 2014 Recipes, Projects & More. All rights reserved.